Starmometer is Your Total Entertainment Blog! Since February 2006, Starmometer is bringing you the hottest entertainment updates from Hollywood and local showbizlandia as well. We are one of the very first blog of its kind, featuring all kinds of genres from tv to music, movies to sports, fad to fashion, news and celebrities, they’re all here! And we are updated 24/7! The blogger behind Starmometer.com is Edsel Roy. He is the owner of Lifebooks, a company publishing fiction (Wattpad, romance novels) and non fiction (self-help, inspirational) titles. American Idol, Pinoy Big Brother, The Voice, The X Factor, 100 Sexiest Men in the Philippines, Party Pilipinas, ASAP, Miss Universe, Miss World, Miss Earth, So You Think You Can Dance, America’s Got Talent, The Voice, The Amazing Race Philippines, Pilipinas Got Talent, K-Pop, Asianovelas, 100 Most Beautiful Women in the Philippines, Hottest 20 Stars Under 20, Primetime TV Programs, reality shows, TV Ratings, the latest local and Hollywood movies, the latest events, trending topics, and many more!!! And why “Starmometer”? Well it’s a coined term using the words “star” and “thermometer”. This site is an instrument measuring the hottest celebrities, the hottest in music, the hottest events and the hottest news in the entertainment industry. And by “hottest” we mean the latest, the freshest and most updated showbiz news. Starmometer registered it’s most-visited day on January 3, 2016, Sunday, with 424,463 unique page views and 892,481 page impressions within 24 hours! The previous record was held last September 13, 2011, Tuesday, with 194,582 unique page views and 321,915 page impressions. 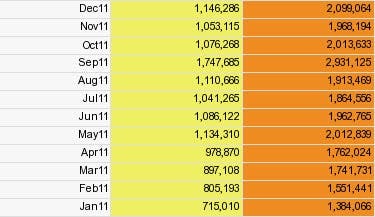 Starmometer’s highest-perfoming month ever was last September 2011 when it received 1,747,685 unique views and 2,931,125 page impressions. Starmometer’s Alexa Ranking as of January 10, 2011 is 43,456th in the world and 233rd in the Philippines. We ended 2011 at no. 42 of Top Philippine Websites (overall ranking) and no. 2 in the blog category. Starmometer claims no credit for any images/videos featured on this site unless otherwise noted. All visual content is copyright to it’s respectful owners. Starmometer is in no way responsible for or has control of the content of any external web site links. Information on this site may contain errors or inaccuracies; we do not make warranty as to the correctness or reliability of the site’s content. If you own rights to any of the images, and do not wish them to appear on this site, please contact us via e-mail and they will be promptly removed. Starmometer by Edsel Roy is licensed under a Creative Commons Attribution 3.0 Unported License. “Your Total Entertainment Blog,” “100 Most Beautiful Women in the Philippines,” “100 Sexiest Men in the Philippines,” “Hottest 20 Stars Under 20,” “The Next Powerhouse Love Team,” “Covergirl of the Year,” “Netizens’ Choice Awards” and “Coverguy of the Year” are properties of Starmometer.com. Napaka bastos mag entertain ng tawag. Sino ba yung baklang napaka unprofessional sumagot ng tawag dyan.Be professional po nakakasira ng imahe ung baklang sumasagot ng phone nyo. The Heartthrob Online Poll B three-hour restriction is UNFAIR!!!!! Weigh your decision for fairness. Due to the restriction you have on Poll B, not the safeguards, one can surmise that the outcome of this contest will be skewed. When are you going to give us an update on who is leading the Facebook poll? No matter who is the winner in the heartthrob contest, the contest will be looked at as flawed. Those who worked hard voting probably want vote again in the online poll B, because it is no longer the contest that it was initially. They probably would make arguments for your other polls being called as disproportionate compared with such a high number for someone in only one poll that puts it in disproportionate with the low numbers that person is receiving in all the other polls, despite multiplying them by 10, 5 or 3 (in which I’m sure that a valid argument could be made that those polls are not compromised). I hate that it was necessary to close poll A, with good reasons as you stated, but it taints the whole contest as to the winner. My enthusiasm about the contest has wanged and participating is futile. Not because of rumors that some say that the contest itself supposed to be rigged toward Thailand this year or that Korea is cheating, it is because the true victory has been displaced and will be weighed as to its truth in the end. A better next heartthrob contest, if there is another. I started to vote now I don’t because once the Korean take over there is no way to beat them not because of their fans but because they are know to cheat and buy their way to where they want to be in polls yesterday at 4pm Peck was 1st with over 130K, Dimash 2nd with 90k JungKooK was not even 4th, but today MIRACULOUSLY HE IS #1 with over 3M votes WOW! REALLY That many Fans in a split of Day you get to 1st with over 3M. Ya a Joke. Edit: Bots are being used. It got auto corrected as boys. It is BOTS .. Boys are being used for voting of Shen cue. Just now Jennifer was leading by 55% and in a single refresh her vote percentage reduced to 45%. Please use some security against bots or captcha. Else no use of keeping such awards. What do the hardworking fans who vote day and night for their favorite stars get out of this, do u give awards/ recognition to winners or is this click bait site to make u money? Fans know nothing, right?